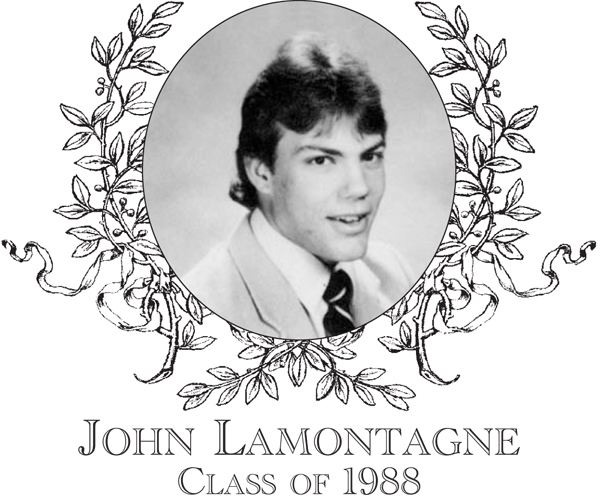 John Lamontagne, Class of 1988, was an outstanding two-sport athlete. John started off his athletic career as a starting middle linebacker for the football squad in his freshman year and continued to do so for the next four seasons. He captained the football team in 1988. By his junior year, John was tearing up the gridiron and was known around Central Mass. as �The Train.� John led the team in yards gained in both in his junior and senior year and he recorded over 3,000 yards and over thirty rushing touchdowns. On defense, he led the team in tackles, in both his junior and senior years, delivering some thunderous hits to opposing ball carriers. �The Train� was presented the Thanksgiving MVP, the �Captain Vincent Sabatinelli Award,� in both his junior and senior years. He was also the recipient of the Elk�s MVP versus Shepherd Hill in 1986 and the Knights of Columbus Sportsmanship Award in 1987. John was inducted into the Central Mass. Chapter of the National Football Foundation in 1986. He was a three-time Border Conference All-Star, and also was named to the Worcester Telegram & Gazette All- Star teams in his junior and senior years. John was also an outstanding and versatile baseball player. In his sophomore year, he played catcher. In his junior year he pitched and caught, and ended the season with an outstanding .500 batting average. In his senior season, he pitched, played first base and was a designated hitter. John was overpowering on the mound, solid defensively, excellent on the base paths, and was known for his monstrous homeruns. He served as the team captain and was named the team MVP in his senior year, and he was also named a three-time Border Conference All-Star. John was a 1992 graduate of Nichols College where he played football for four seasons and was captain as a senior. He set rushing records playing tailback and also played middle linebacker on defense. Additionally, he was also a member of the baseball team for three seasons. In 1999, he was named to the Nichols College Hall of Fame. John later served as a defensive co-coordinator for the Webster Pop Warner football program, and also at both Shrewsbury High School and Bartlett High School. John works for the Small Business Insurance Agency in Worcester. He and his wife Beth Ellen reside in Auburn with their daughters, Sydney and Alyse.